Jeb Bush may say #NeverTrump, but his family doesn&apos;t necessarily agree. 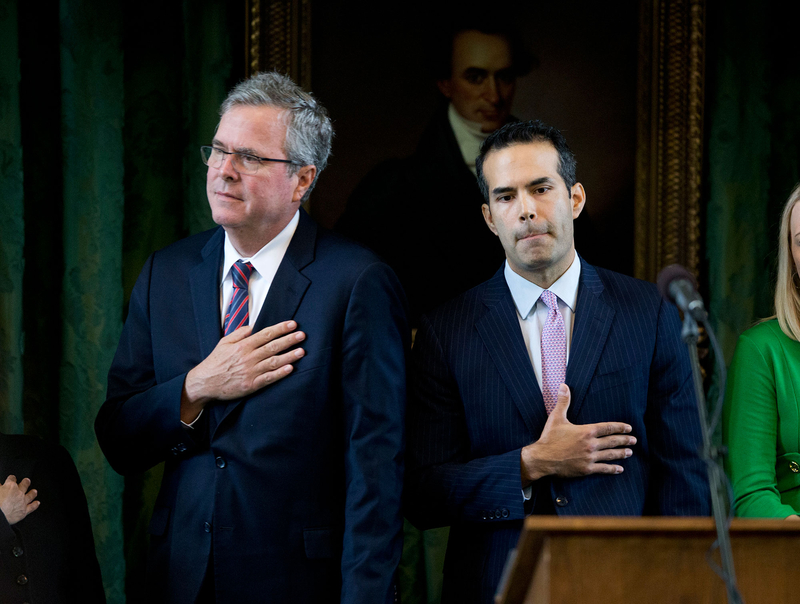 The former Florida governor&apos;s eldest son, George P. Bush, urged Texas Republicans to vote for GOP nominee Donald Trump in the November presidential election, according to the Texas Tribune. George, 40, the Texas Land Commissioner, addressed members of the State Republican Executive Committee Saturday, August 6. As seen in video of his remarks, he acknowledged the discord between his father and Trump but said it was imperative that Republicans unify behind the former Celebrity Apprentice host. "From Team Bush, it&apos;s a bitter pill to swallow, but you know what? You get back up and you help the man that won and you make sure that we stop Hillary Clinton," he told the crowd, according to the video. His father, conversely, has been vocal about not endorsing Trump. In a May 6 statement on Facebook, the former Republican presidential hopeful congratulated the real estate mogul on securing the nomination but said he could not support Trump&apos;s candidacy. "Donald Trump has not demonstrated that temperament or strength of character," the elder Bush&apos;s statement read. "He has not displayed a respect for the Constitution. And he is not a consistent conservative." Jeb and Trump memorably sparred during the primaries, leading to some tense moments during the GOP debates. "I&apos;m sick and tired of him going after my family," Bush said at one February face-to-face. As a result of their war of words, Jeb stated in May, "In November, I will not vote for Donald Trump or Hillary Clinton, but I will support principled conservatives at the state and federal levels, just as I have done my entire life." Jeb&apos;s father and older brother, former Presidents George H.W. Bush and George W. Bush, have also said they won&apos;t endorse Trump for president. All three declined to attend the Republican National Convention last month.